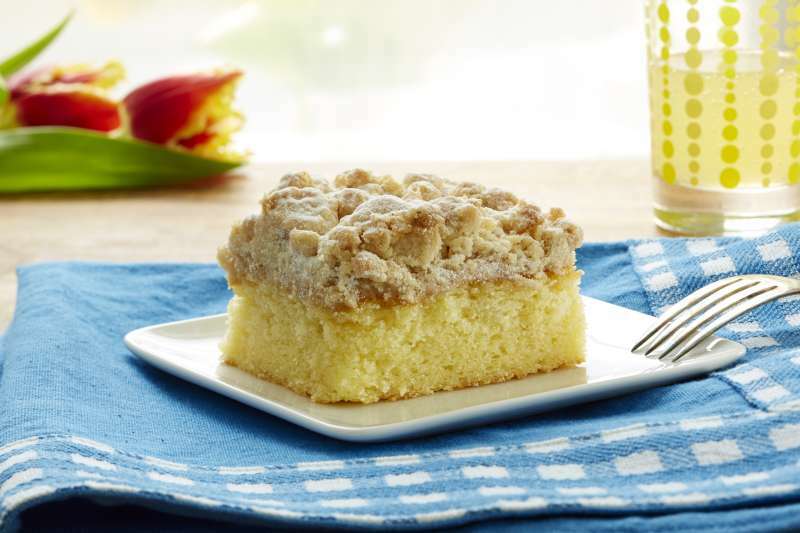 Made from an old family recipe, our delicious crumb cake is baked in a 9" x 13" sheet pan providing 12 slices of moist base and large pieces of crumb topping which is not too sweet. From Anonymous of columbia, South Carolina on 3/31/2019 . I asked Hahn to ship it a later date than my order date .... which they did .... it arrived as stated.... was packaged very well... and tasted very good... my Jersey Girl was pleased. From Lisa Mooney of Chico, California on 2/10/2019 . I purchase this cake every year for my Dad's birthday. He is from NJ and says this is the most delicious and authentic crumb cake he has ever had! The customer service at Hahn's is also top notch. They will always have my business. From Michael of Pace, Florida on 2/4/2019 . Arrives quick even with regular shipping. Always fresh and tastes great. Just like the ones I remember when I lived in the northeast. From Wade Neumann of HOuston, Texas on 1/3/2019 . So Good! Can't be beat! The crumb cake arrived in Texas and was very Fresh. Our family thoroughly enjoyed it. The Best! as always you cakes are a hit of the party! sent to my dad in FLA as a xmas gift. They loved them as did all their guests.